Hello everyone. I wish you all a blessed Sunday. I just realized it's been one whole week since my last post. That wasn't intentional. I've been going through some medical testing and awaiting the results and I haven't felt the best. So, I had to skip out on some of my designing commitments last week. I'm hoping this week brings good news and renewed energy for my crafting passions. Now, it's time for a new challenge at Sentimental Sundays. This is a fun one. We are challenging you to use non-traditonal Christmas colors on your project. Supplies: Blushing Bride CS; Petal Pink and Peacock Liquid Pearls; Spellbinders Lacy Squares; Photoshop Elements. Very pretty Jennipher. Love all the liquid pearls you added! 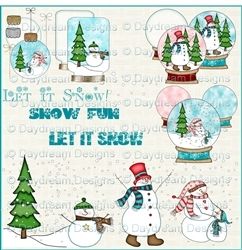 a lovely winterscene with the snowman. the image is beautiful! This is really cute!! These colors are so pretty! 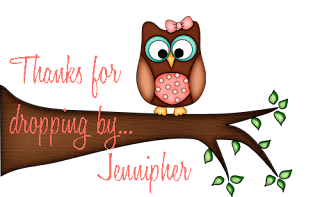 Love, love, love this Jenn! When I saw this in your DT album, you inspired me to go get some liquid pearls. You have to be the LP Queen....what an amazing job of applying them. They look like the real deal!! They perfectly match the colors of your card. This is such a sweet way to frame the snowglobe. The sentiment just ROCKS...love it in that color ON the digi paper. Just a totally adorable card. An amazing creation. You are so talented and I'm so blessed to have you on the Dream Team! Jennipher - !!!! This is so cute! Love the die you used to cut the image and the liquid pearls you added. So cute!! Hope you are feeling better. 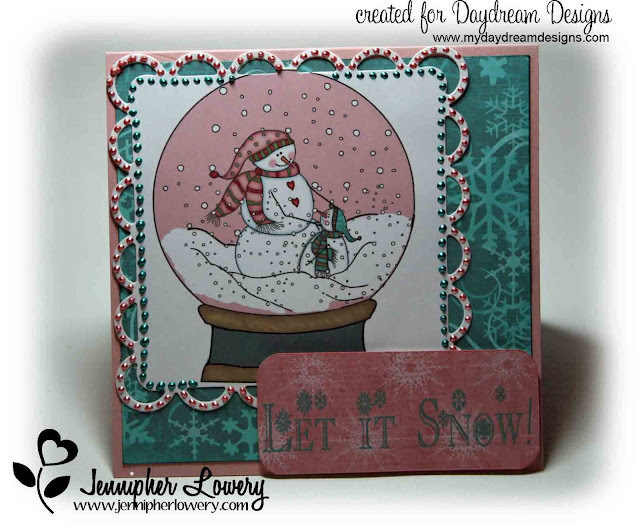 Love the color combo Jennipher and the way you blinged that fab snow globe image with liquid pearls. So pretty! Thanks for joining us at The Squirrel and The Fox. Love your card. Thanks for joining us at Dream Valley challenges. Love, love, love this card Jen. 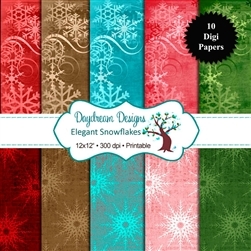 The colors are perfect and of course the digi images are for "daydreaming". So pretty. 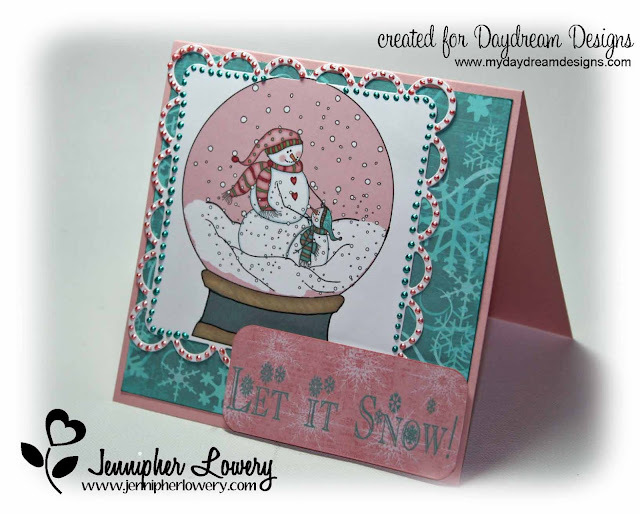 Fine combination of colors and such pretty snowballs! Very pretty - I really like the non-traditional colors and the liquid pearls. Another beautiful card! The snow globe is wonderful and I love your coordinating pearl dots!